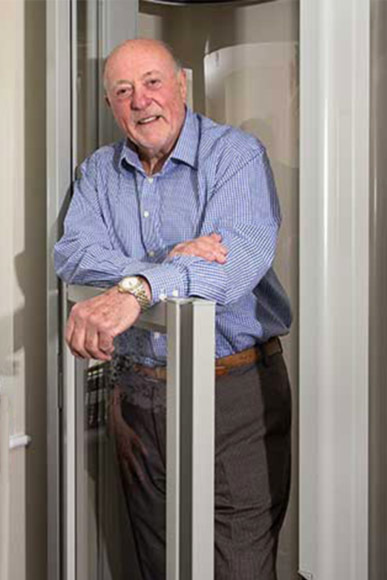 A Stiltz Home Elevator is unique in design and in affordability. This twin post “Stiltz style” elevator uses a small footprint which lends itself to be space effective as well as cost effective. Finally, an elevator that fits! Developed to make life better when climbing stairs becomes too much. 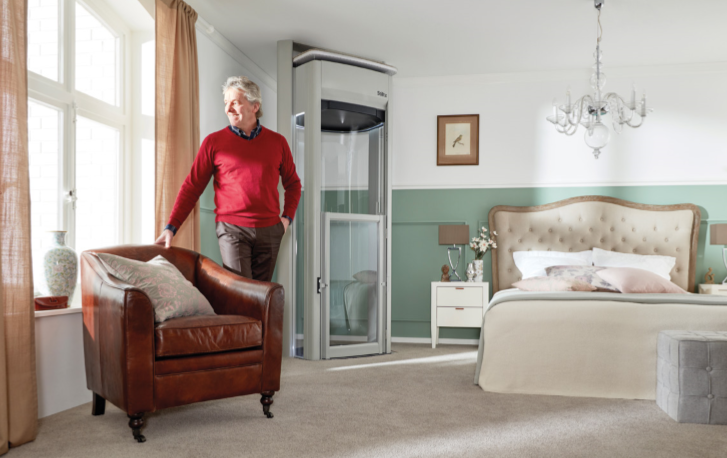 Stiltz is an easy choice when compared to the costs of moving or installing a curved stair way lift. 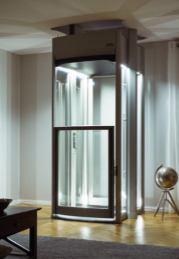 The Stiltz Home Elevator is designed to be just that an elevator. This is not a wheel chair lift transformed into a Stiltz lift. The twin post beams (often found in commercial elevators) are utilized to incorporate a true elevator winding drum drive system. Having an elevator drive system not only allows for longevity and reliability but also offers speeds up to 36 feet per minute. 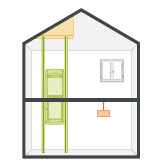 The Stiltz Home Elevator features a full-length cab safety curtain, an under-cab safety pan, slack rope safeties and Stiltz safety sensors. The cab features a half height gate and an electromechanical interlock that only allows the door to open when you arrive at your landing. The elevator can even tell you if it is overloaded. Stitz has even incorporated a battery back-up lowering system in case of emergency. 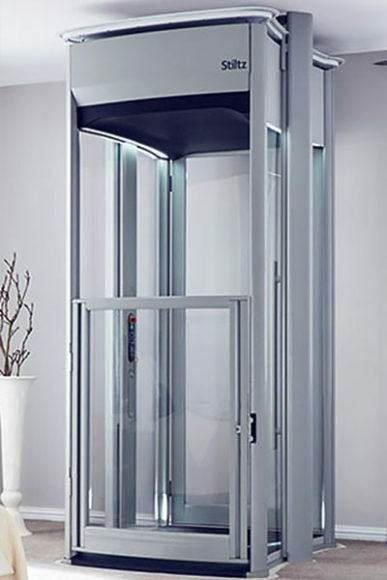 If your home needs a compact elevator please contact us today! This is the most common configuration. 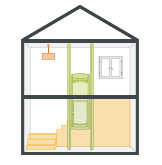 The HomeLift will travel between a downstairs room and arrive upstairs, typically in a bedroom. Where there is enough room in the turn of a staircase this positioning option makes use of the dead space in the void making the HomeLift even more unobtrusive. 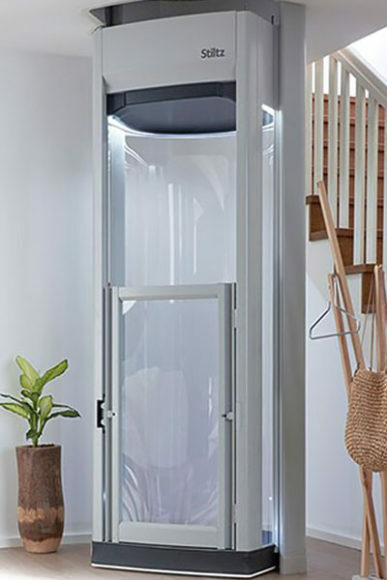 Thanks to the compact nature of a Stiltz HomeLift you can chose to have your lift completely hidden by installing it inside a closet. Our vertical rails need to fix to a horizontal surface. But don’t worry if you have a vaulted ceiling. A contractor can provide clever solutions to overcoming angled or high ceilings. 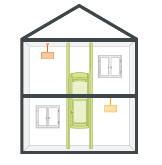 A Stiltz HomeLift will allow you quick and safe access from a garage into your home. 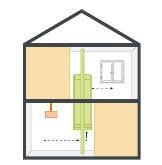 This application will require the construction of a simple shaft in the garage. 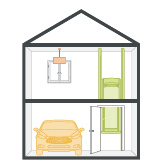 Unique to Stiltz HomeLifts is the Thru-Car concept. 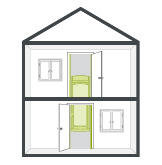 Enter and exit through opposite sides of the lift car – ideal for balcony applications or bi-level homes where a 3-stop lift is needed.